For new cannabis consumers, it can be hard to know where to start your journey. Strains, consumption method, pathology; the information gets overwhelming fast. A quick google search yields results that tell you all the things you can do wrong, but no definitive guide on how to consume. There are a ton of “experts” that just leave you more confused. A trip to the dispensary isn’t always that helpful. There are a lot of products on the market, but how to find what works for you? Many new consumers are attracted to edibles but nervous about the Maureen Dowd effect. Patients using cannabis to treat illness often don’t want to consume a lot of sugar with their medicine. Some people are super conscious of what goes into their bodies. For a long time, consumers had to take a chance or make their own. For the occasional consumer, it seems like a big commitment and a possibly dangerous undertaking. Each step of the journey is unfamiliar, and a little scary. There is so much prep work, by the time the fun part of cooking begins, the excitement of a new creative avenue has palled. Until now cooking with cannabis felt a lot less like a fun hobby and a lot more like hard work. Cooking with cannabis usually starts with a trip to the dispensary to buy flower. After a somewhat educational conversation with a person you possibly babysat, you emerge with your gram of choice and head home to fire up a borrowed magic butter machine or prepare to convert your crockpot, and turn on every extractor fan in your general vicinity. If all goes well, you will end up with a block of beautiful, bright green oil. The issue though, is that you still don’t really know how strong it is. Your final product will vary based on small changes in time, temperature, and “decarb” rate. You can use an online calculator to approximate the final dosing, but, as with all chef’s math, there can be a lot of elasticity in those numbers. If you are inexperienced, you can end up with a dud product or calling off work for a personal day because you underestimated. Either way, a poor showing for a big investment. What if you could spend your time in the kitchen actually cooking with cannabis? Imagine if you could make your favorite salad dressing, or grandma’s best fudge recipe in the same time it usually takes. Would you feel more confident if you controlled your dose more accurately, using familiar tools you already own? CYOC is a line of infused cooking fats and oils for new and experienced users. Every product is lab tested and individually labelled so you can accurately dose for your desired experience. A set of common measuring spoons is the only tool you need to know exactly how much cannabis you are consuming. Olive oil and ghee butter offer endless possibilities for patients and chefs alike, or try adding caramel or lemon curd for additional flavor profiles. Infused directly for whole-plant-wellness (and no lingering solvent-taste,) CYOC takes out the uncertainty. Order online for home delivery, or visit your local dispensary to take your cannabis edible experience a little bit higher. 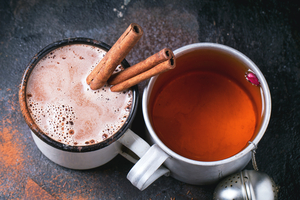 If that still sounds like too much work, just dissolve an old-fashioned Caramellower into your favorite hot beverage for an instant THC Toddy. Place Caramellower into microwave-safe mug and heat on high for 30 seconds until it begins to melt. Pour apple juice or cider into mug and heat on high for 1 minute. Stir with cinnamon stick. Continue heating in 15 second increments to desired temperature. WARNING: Always seek the advice of your physician or other qualified health provider with any questions you may have regarding any medical condition. Always consume responsibly.